October 11, 2018 – IBML announces today the launch of ISIS and TWAIN drivers for its high volume desktop production scanners – the DS 1155 and DS 1210 scanner models – which extends the value of these popular devices by enabling easy integration with most document capture solutions. 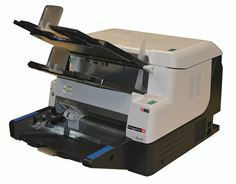 The scanners are ideal for use in a range of industries. This includes banking, insurance, healthcare, government and BPOs where the necessity to lower paper digitising costs is critical and organisations require a scalable platform which is easy to implement and can be upgraded to automate key business processes at the point of capture. IBML’s DS series scanners are perfect for digital mail rooms and other environments where space is at a premium and the workload high. Headquartered in Birmingham, Alabama, IBML (Imaging Business Machines L.L.C) is a global provider of high volume intelligent information capture solutions operating in over 48 countries. IBML’s solutions transform paper documents into actionable data with increased efficiency and quality at reduced cost. IBML’s portfolio includes ImageTrac and DS scanners, ibml Capture Suite software, along with business and support services.